Our eye doctors at Houston Golden Vision are dedicated to your eyes. With extensive industry experience and compassionate patient care, we are ready to serve you and your family with the best eye care in Houston. 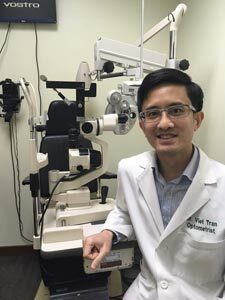 Dr. Viet Tran enjoys being your Houston optometrist and providing quality eye care for the whole family. In his spare time, Dr. Tran enjoys traveling and spending time with his daughter Victoria Tran. He also likes to play chess and billiard. Dr. Tran is fluent is Vietnamese and English. I had an awesome consultation with Ken. He is very professional and nice. His service is amazing! I will definitely be coming back in the future. Friendly and knowledgeable staff. They were concerned about scarring from previous laser surgeries, so they scheduled a second visit to ensure all is well. On time appointments and a wide frame selection. Give them a try. I purchased my glasses from here and the doctor is awesome ! His staff is very friendly, and they all have excellent customer service skills! I plan to make this my permanent eye doctor for me and my family.